A well circumscribed extra axial dura based lobulated mass at the floor of anterior cranial fossa in the mid line overlying cribriform ethmoid. The overlying frontal lobe compressed. 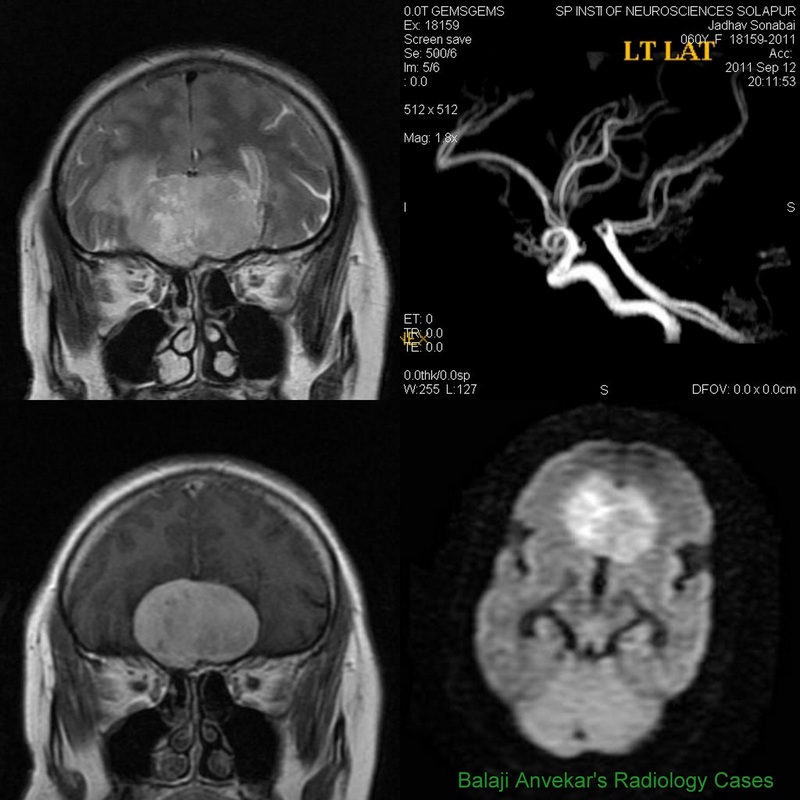 Both the ACA seen as punctate T2 flow voids immediately cranial to mass and elevated by it on lateral view 3D TOF MR Angiography. Lesion is solid signal intensity, slightly hyperintense to cortical grey matter, no cystic component. T2 hyperintense perilesional odema in adjacent brain parenchyma best depicted on FLAIR. Homogeneous enhancement on post contrast T1. High signal on diffusion attributed to atypical nature of Meningioma or implies to dense compact arrangement of cells. Imaging wise diagnosis : Olfactory groove Meningioma, may be atypical as bright signal on diffusion. Intra operative findings consistent with extra axial mass in relation to olfactory groove. Histopathology Report : Meningioma transitional variety.